The problem is, that when you install the scan software, you might get a communication error telling you that the scanner is probably not connected or turned off. Both of course is not the problem. 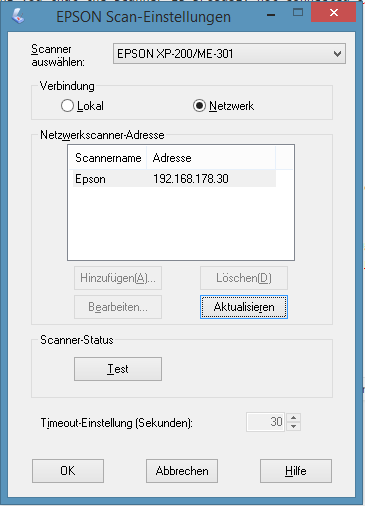 First install the Epson Scan software that you can obtain directly from epson (german version link). Open the scan software and verify that you (still) get the error. Then change to the Windows-Tile screen (just hit the Windows-Key on your keyboard) and type “Epson Scan”. A list should appear that shows the Epson Scan entries. One of them should be “Epson Scan Settings” (german: Epson Scan-Einstellungen). Now comes the tricky part:If you work as an administrator (which you shouldn’t do usually), just open the Epson Scan Settings tool. Otherwise right-click the Epson Scan Settings tool and start it with administrator privileges. This is very important! Otherwise you won’t be able to do the next step as an important part is greyed and thus unavailable! You should see the settings window with “Connection local” selected. Hit the “Network” button and then hit the “add” button below the Networkscanner address field. If this button is disabled, you probably do not run the program with admin privileges. Add the Scanner’s IP and give it a name. Hit the Test button – it should work now! The scan software should work now. I first had some issues that I also had to run it with admin privileges. Sometimes I could start the scanning software, showing the correct user interfacec but it only scanned a very tiny part of the physical scan area (VERY strange). So if you still experience some issues: Try restarting the computer first! If this doesn’t work, try starting as administrator. uninstalled the scan software. Well I tried, the files were still in the windows directory. And – suddenly everything is just fine. 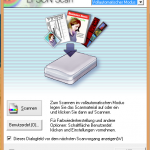 Epson stellt für den relativ alten Scanner “Epson Perfection 1240U” (aus dem Jahr 2001) keine 64bit Treiber für Windows 7 oder Windows 10 bereit. In einem Windows 7-Forum wird ein modifizierter Treiber zum Download angeboten. Aber ehrlich gesagt habe ich Skrupel irgendwelche modifizierten Treiber aus nicht absolut vertrauenswürdigen Quellen zu installieren. Mit IrvanView kann man nun scannen! Geräte unter „Verwandte Einstellungen“ (rechts unten) „Geräte und Drucker“ auswählen. Einstellungen ändern > Treiber > Treiber aktualisieren.